I genuinely don’t even know where to begin with this wedding. 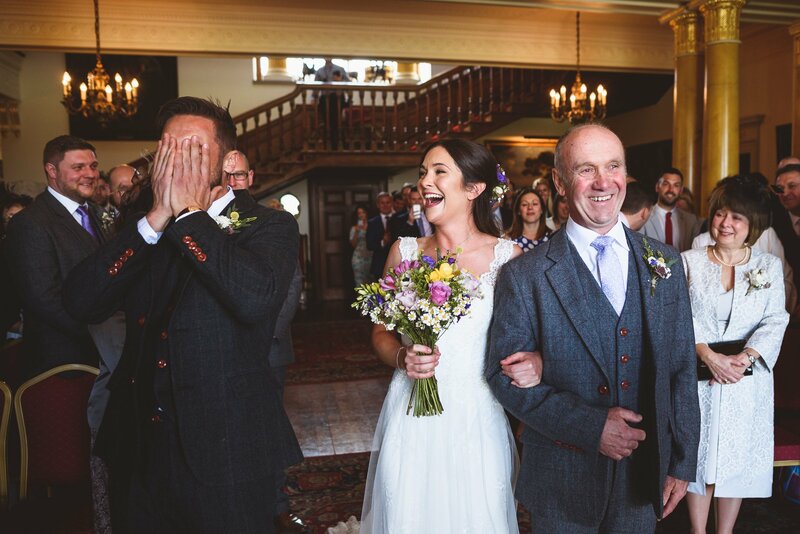 All weddings are emotional, but at different levels, with some people its more of a British stiff upper lip kind of thing, for others its a heart on the sleeve, tears rolling down their cheeks occasion. Guess which is my favourite. This was my first experience of a Walcot Hall Wedding and what a truly unique and quirky wedding venue it is, right up my alley. It’s authentic and unspoiled and distinctly lacking the polish of many wedding venues and a trillion times better for it. It has real character and heart and because of this I think it really helps couples relax and be themselves within its grounds. Definitely amongst my very favourite venues ever. I’m definitely going to be blogging this wedding much much more later this summer but I really couldn’t hold off sharing one Story Frame with you immediately. Ronnie is a cool guy. Composed and collected, he looks like not many things in life phase him. And yet, when Sarah appeared at the foot of the aisle with her Dad he was in pieces and completely happy to be. Smiling, wiping away tears of happiness, laughter echoing around the room, just the perfect moment. These photos are the ones that make me proudest and happiest that I do what I do. I know that this photo will take Sarah & Ronnie right back to this moment and the joy they were feeling ten, twenty, fifty years from now and thats what its all about. What a fantastic capture this is. I’ve no idea what it is they were laughing at but this photo will help the couple remember this moment forever.